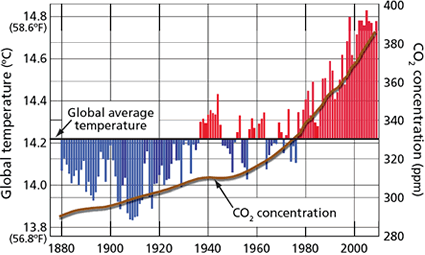 Red bars indicate temperatures above, and blue bars indicate temperature below, the average for 1901–2000. The brown line shows atmospheric CO2 concentration in parts per million (ppm). Measurements from thermometers and satellites unequivocally show that climate is warming. Each of the last three decades has been much warmer than the one before it, with each one setting a new and significant record for the highest global temperature. Confirmation of global warming also comes from melting glaciers, rising sea levels, arctic sea-ice retreat, reduced snow cover, and other changes. Long records of past climate show that the warming of the past 50 years is clearly unusual in a long-term context. Mouse over the image to see the ice reduction between September of 1979 and September of 2012. Glaciologist Eric Rignot of NASA’s Jet Propulsion Laboratory and the University of California, Irvine, narrates this animation depicting the processes leading to the decline of six rapidly melting glaciers in West Antarctica. A new study by Rignot and others finds the rapidly melting section of the West Antarctic Ice Sheet appears to be in an irreversible state of decline, with nothing to stop the glaciers in this area from melting into the sea.